To keep my goals in constant view for 2016, I’ve decided to add a list of them here for ready access. Ideally, all of the little things I’m doing every day will build toward these 2016 goals and intentions. 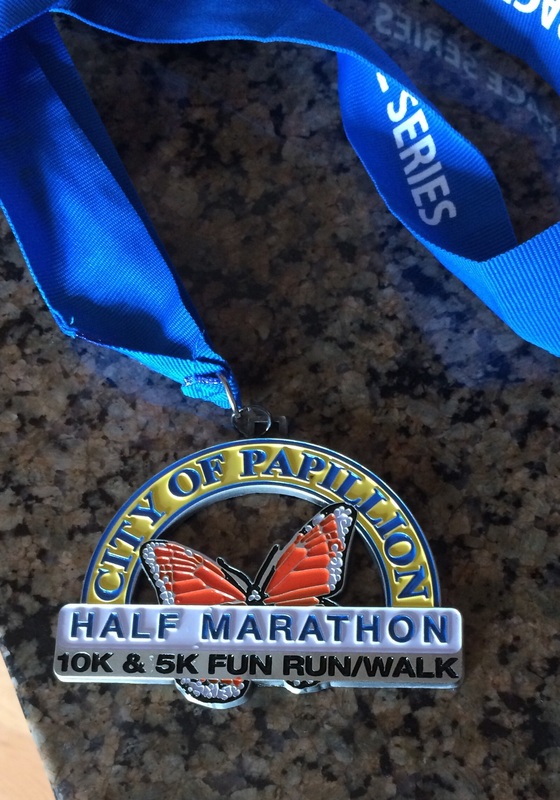 – Run the Papillion Half Marathon again & beat my previous time: For my spring race, I want to go back to Papillion because it was a nice all around race experience. It isn’t crowded and the people were nice, plus it is cheap and local – what’s not to love? Last year, I took it nice and easy on this course and actually didn’t even wear a Garmin! This year, I’m going to take it a little more seriously and try to beat last year’s time (shouldn’t be hard if I stay injury free – 2:41:57 last year) by running the course a little more aggressively. It’s in mid-May, which can be warm, so I’m not gunning for a PR overall, but I do like having a spring race to look forward to. I’ll use the Hanson-esque training plan again because I liked the challenge of running that often, although I may need to tweak it for some more hills given what I know about this course. – Run the I-35 Challenge: The I-35 challenge involves running either the half or full at both the Kansas City race on Saturday and the Des Moines race on Sunday in October. You guys know how much I love the Des Moines race, so stepping up to the challenge this year seems like a fun next step in my adventures with that race. I’ll be applying the lessons I learned from training for the Rebel Challenge to this one for sure. It’ll be fun! There’s a Jeff Galloway training plan that covers 10 weeks for this challenge, which is shorter than my usual half marathon training cycle so I’ll need to be sure I keep my fitness up over the summer after Papillion so I’m ready for this! – Train for a faster 10K: Will I actually run a faster 10K? Who knows, but I think I’ll spend my summer break training for a 10K. I’ve only done 10K training once and it was targeted at covering the distance, without any speed work. This might be a fun way to keep myself busy between my spring race and training for the I-35 challenge in the fall and if I find a race where I can actually set that PR, even better! The Lake Wehrspann 10K is usually sometime over the summer, so maybe I’ll do that one again – even if it did have that evil finishing hill. **I may drop this goal if I do decide to tackle the marathon! – Hike to the top of Pulpit Rock: I’m theoretically going to Norway this summer. If the trip comes through like I’m planning (fingers crossed!) I’m going to climb Pulpit Rock while I’m there (more about it here). It’s a steep cliff that you can hike to the top of – 1982 feet up! It’s a 2.4 mile hike, with lots of stairs and steep hiking. I’ll have to think about how to train for this so I don’t pass out on the way up! I’m thinking that my cross training on days I’m not running will need to incline walking or (ugh) the dreaded stepmill. I know this isn’t technically a running goal, but it’s definitely a big fitness feat! – Speaking of fitness goals, one of my Christmas gifts was a TRX-like suspension system for home use. My goal is learn how to use these at home and regularly incorporate them into my workout routine without injuring myself. – Like I mentioned here, I’m also considering tackling the marathon in early 2017 so I may spend part of 2016 in marathon training! We’ll decide in April. -I’m also working on making peace with the fact that I’m still working with Weight Watchers to maintain my healthy eating, rather than being able to go it alone. It’s okay to need help! 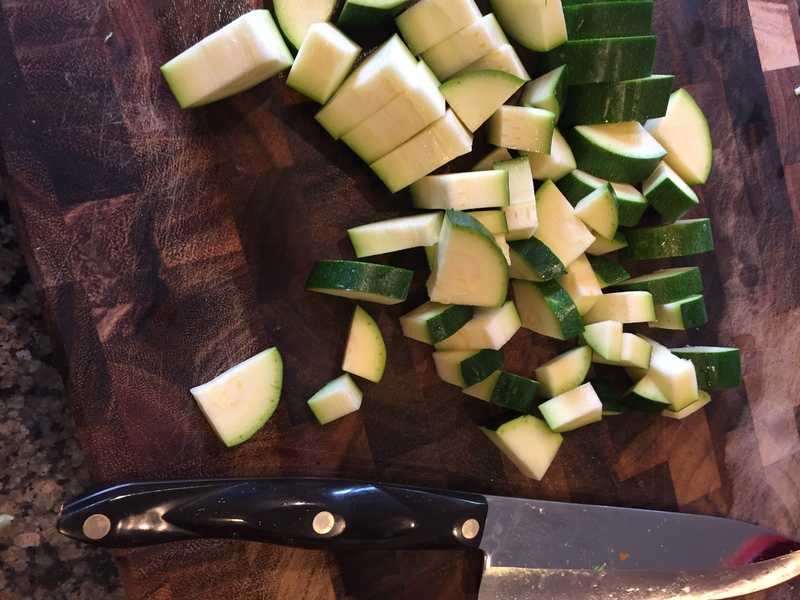 Chopping is so soothing for me! I should do more intensive cooking time more often! -Engage more with my husband, my family & my friends. Time is short – I should play more with the people I love, not my phone. This week, this looks like keeping my phone out of my hand for all of one meal a day with my guys and it is depressingly harder than I thought. -Put good out in the world. We need it. I’m going to smile more, help in big and little ways and give more. -Continue to improve the quality of the food I eat. I’ve noticed that this time around with Weight Watchers, I’m using fewer frankenfood crutches than I did in the past. Certainly, the point structure of the new WW discourages some of the foods with a misleading “health halo” that I used to snack on a lot like granola bars. There are definitely healthier options with less added sugar, so hopefully I’ll keep moving things in the right direction. I’ve made a note in my planner to check in each month to see how I’m doing with these big picture goals!